There are plenty of legitimate benefits to home ownership (like tax credits and one day—in 30 years—getting to own a home outright). And of course there are obvious differences between renting and buying in terms of what you can and can't do, but there are also a lot of myths—and unnecessary moral implications—surrounding home ownership and renting that you absolutely don't need to buy into. Maybe you're not in a position to buy a home any time soon, but that doesn't mean you're "stuck" renting—it's all in how you look at it. Being bombarded with the notion that not owning a home is failing somehow (it's not) can leave you feeling discouraged, but renting has it's upsides too—not to mention, whether or not you own a home yet (or ever) has nothing to do with who you are as a person. This is always the first thing you hear, and even though it's technically true in most cases that buying a home saves you money in the long run, renting is certainly not equivalent to throwing away your money (more on that later, though!). Where people go wrong with this is assuming that buying a home is always an investment and a money-saving move, but that's not necessarily true. 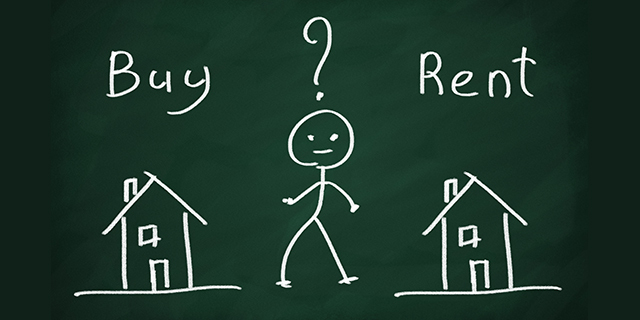 It depends on how long you plan on staying in your home after you buy it, and what happens with the housing market. If you plan on buying a home and staying in it for many years, then yes, it will likely save you money and might be a smart move—but the initial costs of buying a home are steep, so if you're not fully sure where you'll end up in 5 years, it might not be the best decision. Aside from that, when you rent, it's not like you're getting nothing of value for your money—you're paying for a place to live, and tons of convenience and freedom (it's actually quite a luxury, to be honest). You're not responsible for most maintenance like you would be as a homeowner, and often some or even all your utilities are included. Renting a place to live hardly counts as throwing away your money—it may not technically be an investment, but it is buying you time. Renting doesn't always mean you're relegated to plain white walls and can never change a single thing in your home. Sure, some landlords have strict policies for renters, but in many cases, landlords will let you make small changes and paint, so long as you return the walls to their original color before you move out. And sometimes if your home requires maintenance and you have an idea for an upgrade, your landlord will let you do it because it can benefit them when you leave. Your landlord might surprise you, but you won't know until you ask. Along with that, there are plenty of temporary, even strict-landlord-friendly ways to customize your space. Things like temporary wallpaper, changing out hardware and light fixtures (so long as you keep the original ones and put them back before you leave) can make a huge difference in your home without causing any damage—you just have to get creative. You can turn your rental into a reflection of you and make it feel like your dream home even if you don't own it, and don't let anyone tell you otherwise. This goes back to that idea of moral implications surrounding renting or buying—neither renting nor buying are inherently good or bad, and along with that, neither one means anything when it comes to being an adult. Assigning moral values to renting and buying is harmful—silly at best—and says nothing about you, your life and your successes. Adulthood is about independence and responsibilities (and that's just the basics—it's also about coming into your own as a person, finding your confidence, pursuing and living out your goals, etc.) and whether you're paying rent or a mortgage has no bearing on your status as an adult. Having to answer to a landlord doesn't take away your independence, and owning a home doesn't magically mean you have your entire life together, even if it may seem that way. Sometimes buying a home makes sense, and sometimes renting is your best option—that's just a circumstance, not a character trait.